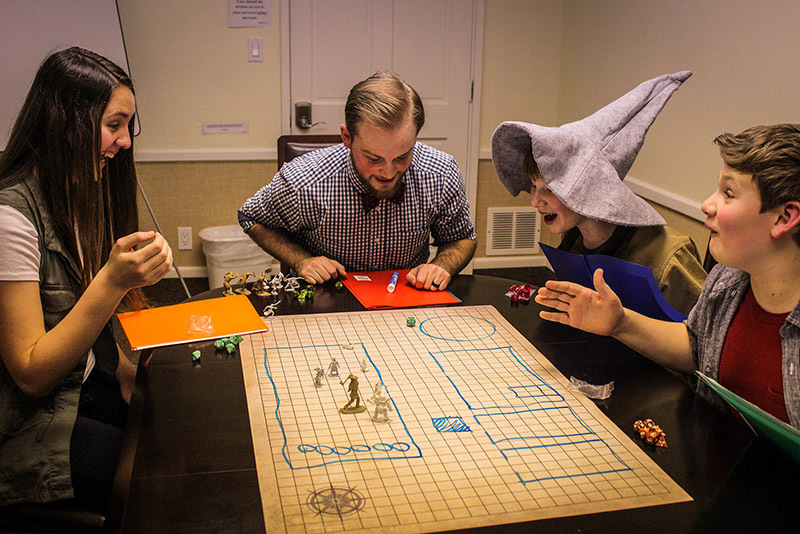 What is Tabletop Role-Playing Game Therapy (TRPG)? 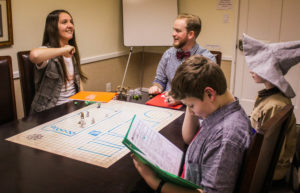 TRPG Therapy is group therapy which utilizes narrative and role play therapies combined into a game where participants work as a team to solve problems, improve interpersonal effectiveness, increase distress-tolerance, and increase critical thinking skills through the use of storytelling and game play. During TRPG Therapy, group members meet together for 90 minutes and interact with the therapist who acts as the main storyteller. Group members must make decisions based on the story and choose how their character will interact with other group members’ characters, and characters from the story referred to as non-player characters or NPCs. The therapist will create challenges for participants which focus on developing social skills, increasing distress tolerance, increasing communication skills, increasing, problem solving skills, and more. 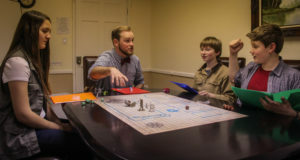 Choices made by group members—be it attacking, hiding, searching through a room, trying to convince a guard to let them pass—are determined successful or unsuccessful by the roll of a die (typically a 20-sided die) added to that player’s skill level. The therapist will determine how difficult a given task is and thus determine how high a player must roll in order to be successful. For example: Player “A” determines that they want to try and build a raft to cross a river. The therapist determines that this is a difficult task since the river is fast flowing and decides that a total score of 21 or higher is needed for the player to successfully cross the river. What are the benefits of TRPG Therapy? TRPG Therapy works with many psychosocial skills. Here are a few ways TRPG Therapy helps. Building empathy and perspective taking skills through in-game interactions: in TRPG therapy participants are constantly reminded that they can only act on what their character knows. This is one basic rule of TRPG Therapy. Participants are able to hear everything that is happening in the game, but they must take the perspective of their character and act accordingly. The structure of the game also inherently teaches participants that they cannot walk around assuming that everyone thinks like them and talks like them. They must take perspective of others in order to succeed. Problem solving builds distress tolerance: Throughout the game participants will encounter challenges which will cause some frustration and solutions may not be readily apparent. With support from the therapist they will learn to cope with distress and calmly work through challenging situations. In-game interactions teach appropriate social boundaries and teach participants to think about consequences before they act: There is literally no limit to what participants can try in TRPG Therapy so long as it seems practical to their character. Children who have poor social boundaries outside of therapy generally have poor boundaries in therapy as well. In TRPG Therapy they can act on their impulses, but they will face consequences for those impulses in a safe manner, and the therapist can immediately process what happened with participants to help them connect the dots between their behaviors and how their behaviors affect social interactions. For example if a participant decides to steal from a store in the game, the natural consequence may be that no shop owner will allow them in to their store in the future. Consequences are determined by the therapist who takes the role of any axillary characters in game. TRPG Therapy builds interpersonal effectiveness skills: Through interactions with fellow group members participants must learn to communicate their feelings, needs, and ideas in a clear and appropriate manner. Group members must also learn how to work as a team and tackle challenges together as the primary rule of TRPG Therapy is “You fail or succeed as a team.” As a result, participants must learn to play to each other’s strengths throughout each session. They may even learn from each other’s mistakes, but most important of all it creates supportive relationships that can last a lifetime, helping participants know that they can be supported and that they are likeable. Taking on the Role of Character Develops Personal Insight and Builds Confidence: Taking on the role of an imaginary character allows participants to try on new ideas in a safe way which allows them to make mistakes that don’t have long lasting impact, it allows them to feel an authentic sense of accomplishment as they solve problems, and make unexpected connections. When a participant is allowed to play out successes in the TRPG they will start to naturally develop confidence in themselves. Furthermore, participants will develop a “wondering mind” where they use their imagination to solve problems, investigate other people’s actions and motives, or persevere through challenges.